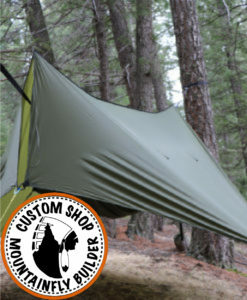 Below is a detailed description of all the available mods and options for our tarps. 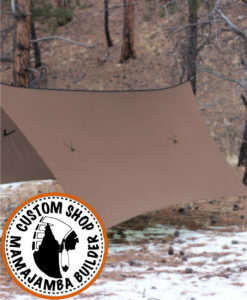 We currently offer three different tarp fabric options. The 30d silnylon is a little heavier and stretchier and is a good bit more durable than the other two, making it less likely to be damaged from a falling branch or tripping over a guyline. The 20d silpoly is a lighter polyester fabric that offers slight weight savings and less water absorption (both fabrics are fully waterproof, but both will absorb some water weight, with the silpoly absorbing less water weight than the silnylon in wet conditions. 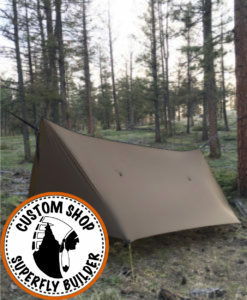 The third option, 30d silpoly is what our camo tarp fabric is made of, it’s a slightly heavier, slightly more durable version of the 20d silpoly. 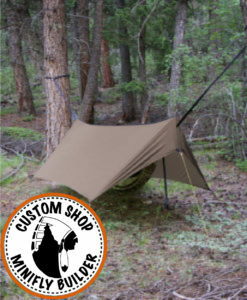 Our camo tarps are ONLY available in the 30d silpoly. All three fabrics have a minimum 2000mm h2o rating. 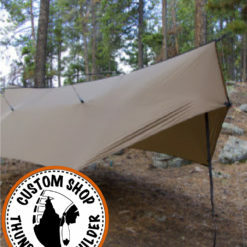 The high rating means that your tarp fabric will be waterproof when you buy it and it will stay that way even after lots of use. We offer all our tarp models in 11′, 12′ and 13′ lengths. 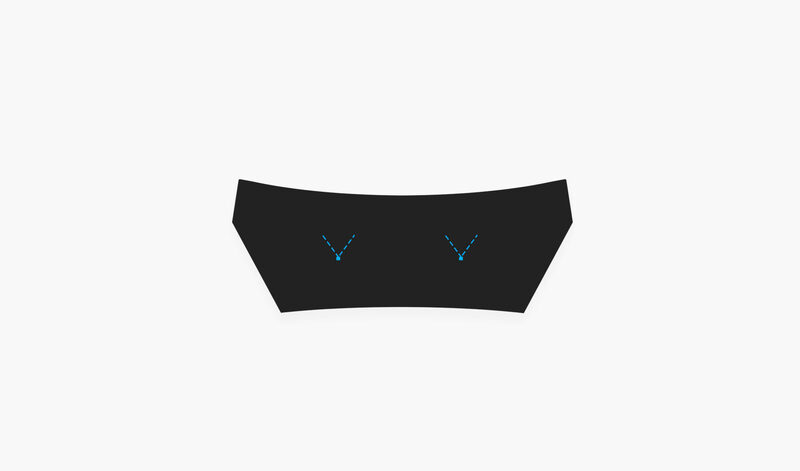 This length refers to the length of the Ridge-seam. 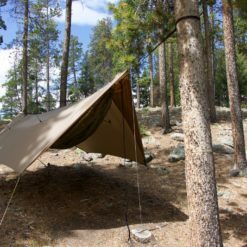 In general, the 11′ tarps are most appropriate for end gathered style hammocks like our Blackbird, XLC and Eldorado, while the 13′ versions are best suited for bridge hammocks like our Ridgerunner. 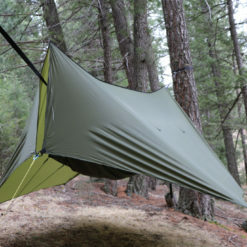 The doors on any of our 13′ “Fly” series of tarps will fully close around the suspension triangle of the Ridgerunner. 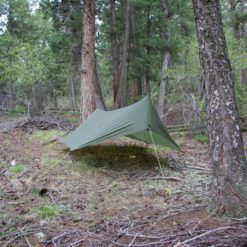 We also offer a 12′ option which would be most useful on a Hex shaped tarp like our Mamajamba, with the 12′ MJ giving more end coverage than the 11′ MJ. Unlike the MJ hex tarp, tarps with doors do NOT see an increase in end coverage by jumping from 11’ to 12’ version. 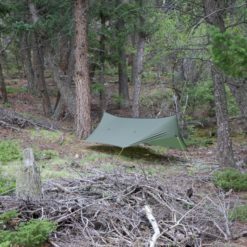 Panel pulls are the tarp tieout points that are not along the perimeter of the tarp but rather in the middle of the tarp (generally 2-3 feet down from the ridge-seam). 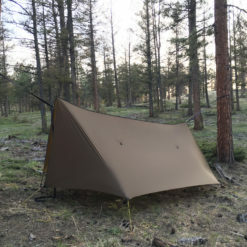 Panel pulls allow you to attach guyline and pull the middle of the tarp outward slightly to increase interior space, making your tarp feel bigger and roomier inside, they are also staked out in windy conditions to keep the wind from pushing the tarp inward against your hammock. If your tarp has panel pulls, you can elect to not use them whenever that is most convenient, you could use them with guyline for maximum support against wind, or you can use one of the Panel Pull Pole Kits instead (see below). Panel pulls will need to be seam-sealed with silicone prior to use and you will receive a small tube with instructions if you order panel pulls. 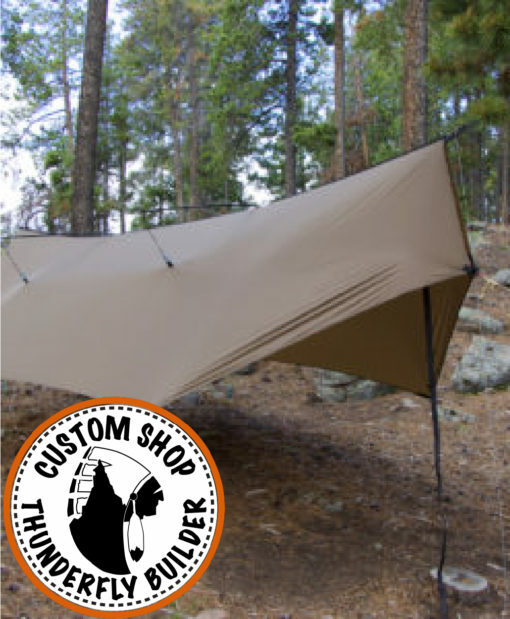 Panel pulls are optional on our mid-size tarp models (Thunderfly and Mamajamba), they come included in the price on the full size tarp models (Superfly, Mountainfly, Cloudburst), and they are not an option on our smallest tarp model (Minifly). 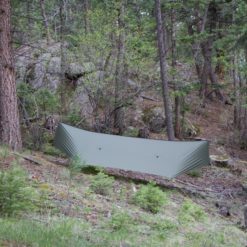 If you are ordering a 13′ tarp, by default the panel pulls will be spaced at 77″ apart to be most compatible with the poles of Bridge-style hammocks like our Ridgerunner and they will be spaced slightly less than that on the 11′ and 12′ versions. 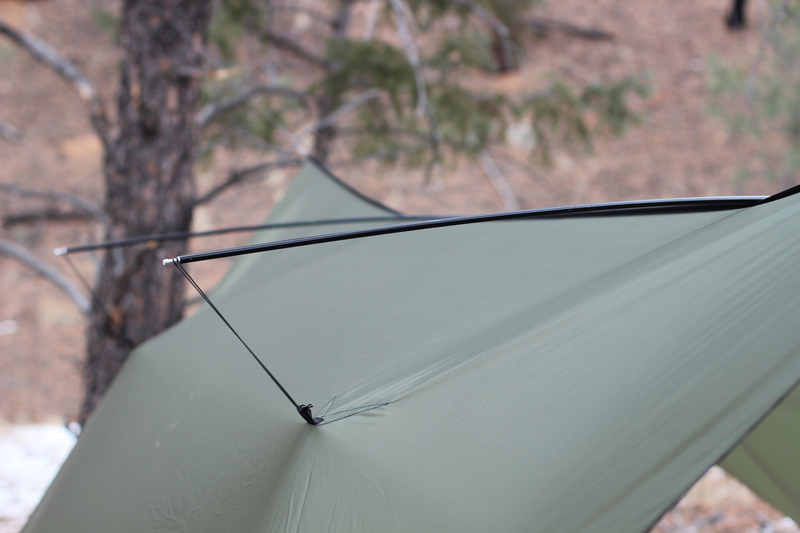 13′ tarps will also come with 2 rings on the underside of the ridgeseam to attach your Ridgerunner bugnet cords to. The Center Ground Tieout Mod is simply a middle ground tieout on each side of the tarp in the middle between the two main ground corner tieouts. 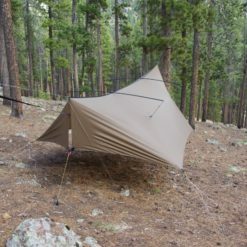 The Cloudburst tarp comes with center ground tieouts included in the price, the other tarp models have this as an optional add-on. Since the Cloudburst tarp already has the center ground tieouts included in the price, this option is for adding Pole Tip Pockets onto those already included ground tieouts. Note: Center pole itself sold separately. 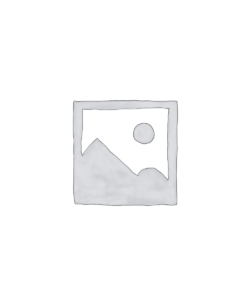 More info and rigging method shown above. This is just the appropriate Center Pole that is compatible with either of the two Pole Tip mods above. More info and rigging method shown above. The 60′ spools are just long enough to give you two 12′ lines for your trees and six 6′ lines for the ground corners and doors, so about perfect for a Minifly or a Thunderfly or Mamajambe without panel pulls… or for somebody who doesn’t need extra cord for panel pulls (someone using the Panel Pull Pole Kit instead for instance). The 100′ spool will give you 40 feet extra to cover your panel pulls or just to have some spare guyline on hand. Our guyline is made form ultra strong, ultra lightweight, high-tech UHMWPE fiber and has a medium weight PU coating to increase the stiffness for added performance and handling. Single braid construction with a tensile strength of 400 lbs and a weight of about 1/2 gram per foot. The yellow has enough visibility at night to see it without a headlamp, while the other colors are harder to see in the dark.